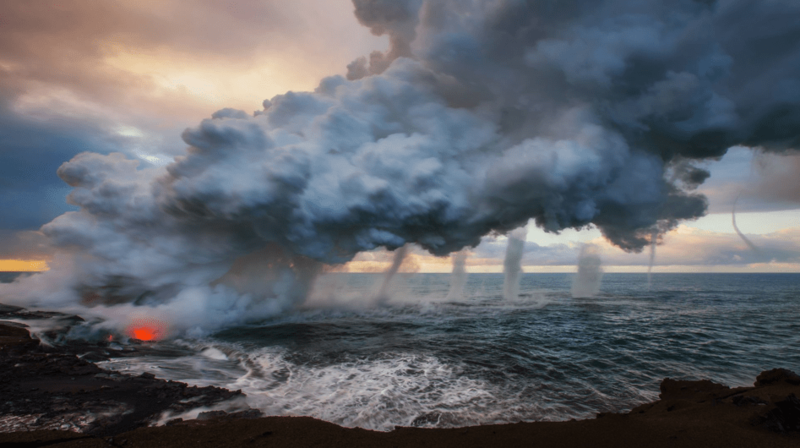 HILO, Hawaii — Bruce Omori, owner of Extreme Exposures Fine Art Gallery in Hilo, received the Windland Smith Rice International Award for his lava photo titled “Volcanic Vortices,” which will be displayed at the Smithsonian Museum of Natural History’s annual exhibition in June. His winning photograph was selected from almost 20,000 submissions from photographers in 46 countries. Next articleWho Do You Believe in the Hawaii Republican Party? A vortex or two is a pretty rare sight—but when one after another kept forming, my fumbling with the lenses turned into a panicked rush to switch my telephoto to wide angle lens to capture this awesome scene of seven vortices in a row.